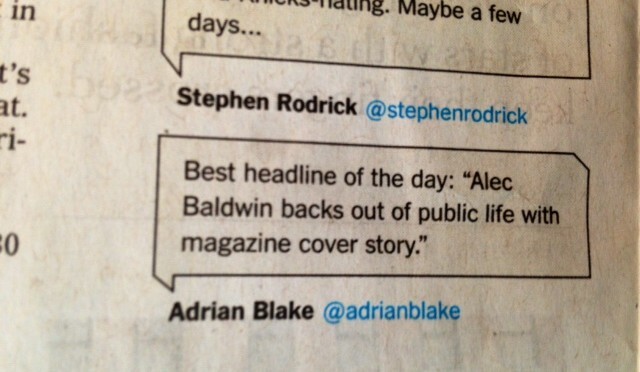 In the second of our Alec Baldwin series, a tweet of mine about Mr. Baldwin’s noisy exit from public life was picked up yesterday by the New York Times. Wide exposure to a slightly off-target data point isn’t bad. I reemphasize brand values which are secondary but relevant (funny, plugged in) and I potentially pick up new followers. (Yesterday I did pick up quite a few Twitter followers, but it’s hard to tell what made them follow me.) It may help for SEO, but it’s too early to tell. Having the right creative matters, but having the right distribution matters too. That tweet might have been trivial, but it was well-distributed, and something may come of that. But where the rubber meets the road, someone subscribing to this blog is a lot more valuable to me than someone seeing one witty tweet on paper. Attention is nice, but it doesn’t always create value. Your brand is a sponge and mine is too. And now I get a little of Alec Baldwin’s and The New York Times‘ brand mojo rubbing off on me for a short time. That tweet is a nice thing for my brand, but this game is about building up lots of data points, not just one, and specifically data points that show that I’m valuable, not just that I’m amusing.